Crítica de Michael Hingston, escritor e editor em Edmonton, Alberta (Canadá), publicada no blog "Too many books in the kitchen". O autor escreve regularmente em jornais como o Natuional Post, Globe and Mail, The Edmonton Journal, The Georgia Straight e Alberta Views. José Saramago was a notorious late bloomer. When the future Nobel laureate starting publishing in earnest, after a couple of one-offs, he was already in his mid-50s. And by the time he really hit his stride, starting in the late 1980s—a run that produced novels like The History of the Siege of Lisbon, Blindness, and All the Names—Saramago was literally a senior citizen. But age never slowed him down. He kept writing excellent fiction until the very end and, in a way, beyond, since nearly a half-dozen of Saramago’s books have been translated into English since his death in 2010. 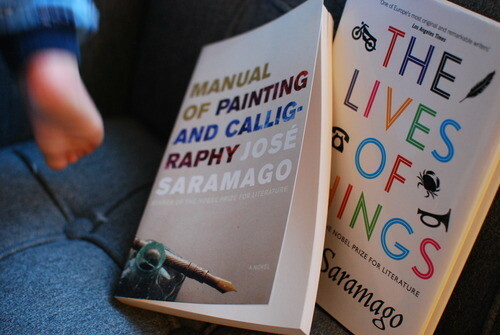 By fluke, two of Saramago’s oldest titles made their way to North America this spring for the first time: his little-read sophomore novel, 1976’s Manual of Painting and Calligraphy, and his only collection of short fiction (so far as I know), 1978’s The Lives of Things. Each book reveals a writer whose obsessions and inimitable style appear to have arrived on the page fully formed. Either that, or Saramago spent his 20s, 30s, and 40s honing his craft in private, and then burning the evidence. The stories in The Lives of Things (translated by Giovanni Pontiero, Verso, 128 pp., $28.50, hardcover) show Saramago’s talents as slightly more nascent, not quite in full bloom. They alternate between ripe political allegory and extremely detailed absurdist thought experiments. They also meander, and the calibre of the ideas themselves varies; most of this you can chalk up to the form itself, which you can tell Saramago is just dabbling in, and which he doesn’t fully understand. And all of the stories are very concerned with the “things” mentioned in the collection’s title. This turns out to be a clear nod to Saramago’s socialist politics, which will continue to bubble furiously away beneath the surface of most of his future work. In “Embargo,” we focus on a man’s car, and more specifically the gas tank and malfunctioning gearstick that make him needlessly line up, again and again, for refueling during a shortage. In the aptly titled “Things,” the contents of an entire town start vanishing in the middle of the night. And in “The Chair,” Saramago goes into minute, semi-fantastical detail about the deckchair in which Portuguese dictator António de OliveiraSalazar was sitting when it collapsed, ultimately leading to the man’s death from a brain hemorrhage. The novel takes the form of H.’s diary as he struggles with the portrait of a nondescript industrialist dubbed S. (in a vintage Saramagean move, all characters essential to the story are reduced to the first letter of their name). He can’t recreate some elusive part of S.’s likeness on canvas, and so turns to writing as a means of getting at the man from a different angle. He also starts covertly painting a second portrait—a piece that could well be called painting—but one that’s far too honest to ever show the client. It’s remarkable how similar Manual is to many of Saramago’s later works. There’s the long, winding, fearless sentences, but also the deep appreciation for geography and hand-crafted art, as well as a fierce feminist streak. Then you remember: oh, right. Saramago was in middle age when he wrote this. Of course there’s no stumbling self-discovery on the page—he’d already had decades of life experience to draw from. The novel starts off incredibly strong, but loses some momentum as Saramago tries to cover too much ground. Twenty years later, I’m sure he would have had no problem filling a novel with just the quest to finish two simultaneous portraits—and what a wonderful book that could’ve been. Instead, we get another painting commission, a third-act love interest, and an unnecessary political detour. The mysterious second portrait disappears far too early on. Yet I’ll admit I read the final stretch of the novel with a slight sense of relief: for an author to hit a nerve as strongly as he would so frequently later on, in what was essentially his first time out of the gate, would have been a very scary prospect indeed. With these minor stumbles, as in the some of the stories, Saramago reminds us that he was human after all.